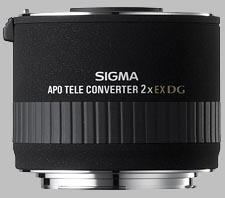 (From company literature) These are dedicated APO teleconverters that can be mounted between select lenses and the camera body to increase the focal length by the power of 2X. The new multi layer coating reduces flare and ghost, which is a common problem with digital cameras. They demonstrate best performance with DG series lenses. They also offer maximum photography magnification by 2X without any variation in the minimum focusing distance. Compact and lightweight, these teleconverters convert your lenses into longer focal-length lenses, so you don't have to do a lot of unnecessary footwork. A very good converter. The construction is top notch, I like the Sigma finish. On my Sigma 70-200/2.8 w/1-Series cameras this and the 1.4x do an Excellent job. In bright light the AF is still snappy. In lower light the AF does slow down. I am quite pleased with the IQ I got with these combos. The color and the contrast is quite good Sigma scores again.